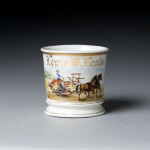 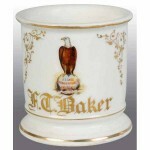 Mugs related to farming include agriculture such as growing fruits, vegetables, plants, flowers, and raising livestock. 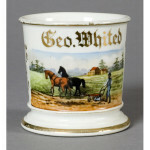 Common scenes related to farming include greenhouses, plowing, still-life style images of the items the farmer grows, images of the breed of animal raised, and more. 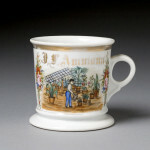 The value of many of these mugs is related to subject matter on the mug. 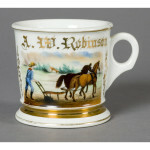 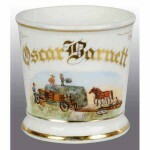 Generally mugs with action scenes showing the farmer are more valuable than scenes showing vegetables or an animal.